Inverters convert battery power and turn it into AC power you can use in your boat, truck, RV, or your cabin in the woods. Sine Wave inverters make AC power that is indistinguishable from the grid power you get at home. All the inverters shown here have a 120 Volt Sine Wave output and input voltages of 12 or 24 volts. Full sine wave output is particularly useful for powering motors or sensitive electronic equipment. 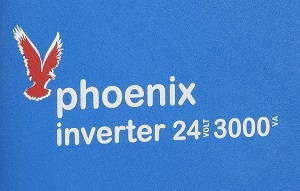 The larger inverters shown here can be ganged together to get greater output or to power split phase or three phase systems. 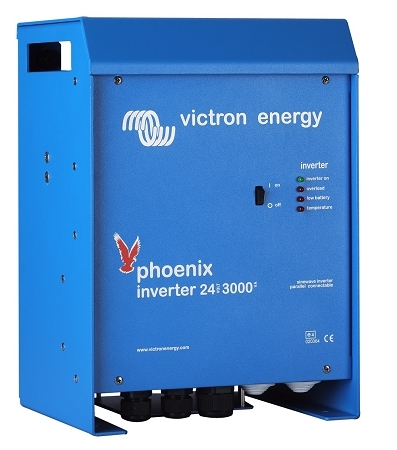 A well as the Sine Wave Inverters shown above Victron Energy manufactures an even more extensive range of inverter chargers. 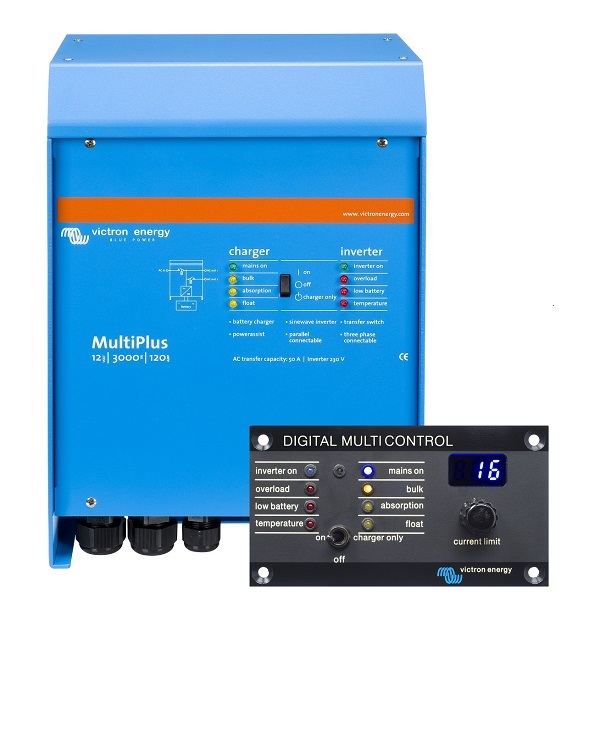 These combination units are used for battery charging when grid power is available and act as inverters when grid power is not available. Sortie sinusoïdale pure, puissance de crête et efficacité élevée. Les technologies combinées de haute fréquence et de fréquence du secteur assurent le meilleur des deux mondes. Gamme de modèles allant de 150 VA à 3000 VA par module. Sinuswellen-Ausgang, hohe Spitzenleistung und hoher Leistungsgrad. Die Kombination aus Hochfrequenz- und Netzfrequenztechnologie bietet optimale Voraussetzungen. Es gibt Modelle für den Bereich von 150 VA bis 3000 VA pro Modul. Reiner Salida sinusoidal pura, alta potencia y alto rendimiento. La combinación de alta frecuencia y frecuencia de línea garantizan lo mejor de ambas tecnologías. Disponible en modelos de entre 150VA y 3000VA. Conexión en paralelo y trifásica: se pueden conectar en paralelo hasta seis inversores Phoenix, en configuración monofásica, bifásica o trifásica. Высококачественные синусные инверторы, с высокой импульсной мощностью и высокой эффективностью. Сочетают в себе ВЧ и НЧ технологии. Модели представлены в диапазоне от 150ВА до 3000ВА. До 6 единиц инверторов Phoenix 3000 могут работать параллельно в расщепленной фазе, в 1- фазной, и в 3-фазной конфигурациях.